Emily Laverne Harding (October 10, 1905 – September 25, 1984) was an American animator. 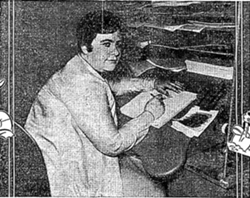 Harding, who worked for the Walter Lantz studio for much of her half-century career in animation, is among the earliest woman animators. She is also one of the few women to receive a Windsor McCay Lifetime Achievement Award, one of the most prestigious awards in animation (only nine women have been recognized out of 161 awards given). She won this award in 1980. By 1932, Harding had settled in Los Angeles and was a student at the Chouinard Art Institute. Working for the Lantz studio from 1934 until 1960, Harding was particularly noted for her work on Woody Woodpecker cartoons; she designed the version of the character that was in use from 1950 to 1999. While working for the Lantz studios, Harding also drew a humorous newspaper strip, Cynical Susie, for United Feature Syndicate. Cynical Susie revolved around the exploits of the titular heroine, (a dwarf woman) and her pet cow, Lily Whey. After leaving Lantz, she animated for Hanna-Barbera cartoons such as Yogi Bear. She later worked for DePatie-Freleng Enterprises on Pink Panther cartoons, and was briefly employed at Warner Bros. and Filmation as well. Harding was a native of the state of Louisiana.